At Davinci Virtual we are advocates for healthy living and work-life balance. 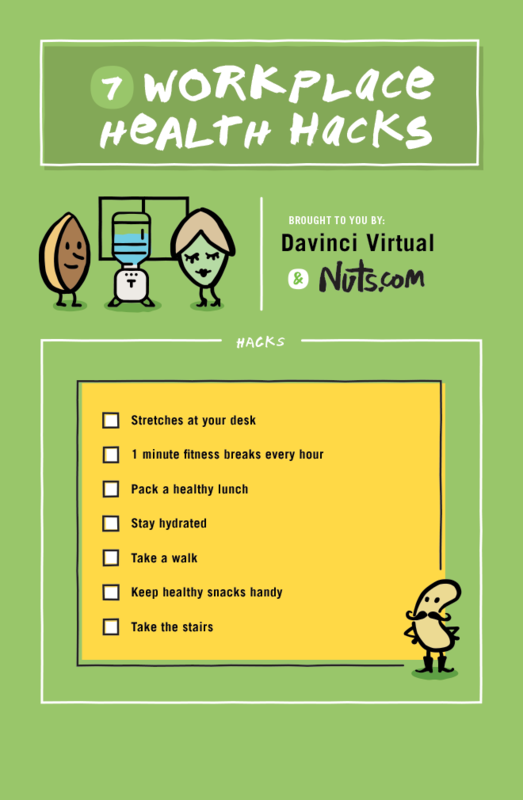 In partnership with Nuts.com we have created a great checklist for ways to stay healthy at work! WebMD posted an article stating "People who sit at their computers for hours every day -- they're in for serious medical problems," says Sharon Hame, MD, associate clinical professor at UCLA's department of orthopaedic surgery. A lot of us have sedentary jobs and we need to make sure we are taking care of our bodies. Themuse.com has posted a great infographic you can print off or "pin" with some great stretches to try. We suggest you start by setting a reminder to do stretches every 2 hours and then go from there. Ever heard of minute-to-win-it games? At Davinci we love playing games. Each day write down a list of 8 exercises to do that day. Set yourself a reminder to go off once an hour and then time yourself. Here's a list from greatist.com to get you started! Being busy at work makes it hard to eat healthy. Grabbing a burger takes a lot less time than waiting for a salad to be made. A great alternative to eating out is packing a healthy lunch. If you bring your food to work, you'll be less likely to go out. Easier on your waistline and easier on your wallet. It's a win-win! Check out this great post from Popsugar.com to find some ideas. When you are busy, keeping yourself hydrated can be the last thing on your mind. Water is one of the building blocks of life. An easy fix to staying hydrated is to keep a large mug at your desk full of water. You can add flavorings or ice, whatever it takes to keep you hydrated. Getting up and moving is one of the best things you can do for your body. Instead of sending an email to the person sitting across the office, walk over and tell them you like their new hair cut. If you work out of a Virtual Office, take a moment to get up and move around during the day. If you keep a stock of snacks at work you will be less likely to overeat at lunch or dinner. Nuts.com offers a wide variety of healthy and filling snacks, from nuts to dried fruits and more. If you fuel your body throughout the day, you will be able to be more productive. Harvard Business Review offers this tip: "Instead of letting your glucose bottom out around lunch time, you’ll perform better by grazing throughout the day." There are a lot of benefits from taking the stairs. Start your day out right by getting your heart pumping and your brain ready to take on the day. Take advantage of a Live Virtual Receptionist and get out and move! Let us do the work so you don't have to.